background Fills the entire control. dayOfWeekDelegate One instance per day of week. weekNumberDelegate One instance per week. dayDelegate One instance per day of month. color: styleData.valid ? "white" : "grey"
The background of the calendar. The implicit size of the calendar is calculated based on the implicit size of the background delegate. The Calendar this style is attached to. The delegate that styles each date in the calendar. readonly property date styleData.date The date this delegate represents. readonly property bool styleData.selected true if this is the selected date. readonly property int styleData.index The index of this delegate. readonly property bool styleData.valid true if this date is greater than or equal to than minimumDate and less than or equal to maximumDate. readonly property bool styleData.today true if this date is equal to today's date. readonly property bool styleData.visibleMonth true if the month in this date is the visible month. readonly property bool styleData.hovered true if the mouse is over this cell. Note: This property is true even when the mouse is hovered over an invalid date. readonly property bool styleData.pressed true if the mouse is pressed on this cell. Note: This property is true even when the mouse is pressed on an invalid date. The delegate that styles each weekday. The height of the weekday row is calculated based on the maximum implicit height of the delegates. readonly property int styleData.index The index (0-6) of the delegate. This property determines the visibility of the grid. 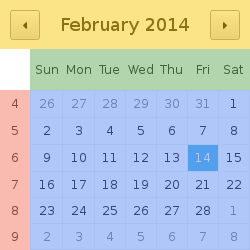 The navigation bar of the calendar. Styles the bar at the top of the calendar that contains the next month/previous month buttons and the selected date label. readonly property string styleData.title The title of the calendar. The delegate that styles each week number. The width of the week number column is calculated based on the maximum implicit width of the delegates. readonly property int styleData.index The index (0-5) of the delegate. readonly property int styleData.weekNumber The number of the week this delegate represents.